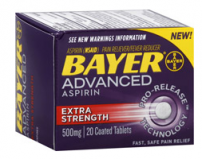 FREE Bayer Aspirin at Walmart, Rite Aid & CVS! 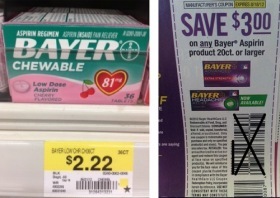 There is a high-value $3/1 any 20+ ct Bayer Aspirin product coupon in today's (6/24) SS insert. Take it to the following stores to score free medicine! *Also scan your card at the Magic Coupon Machine for a possible $3/1 CVS store coupon!